Wisconsin Historical Society Press, 9780870208836, 432pp. Madison made history in the sixties. Landmark civil rights laws were passed. Pivotal campus protests were waged. A spring block party turned into a three-night riot. Factor in urban renewal troubles, a bitter battle over efforts to build Frank Lloyd Wright’s Monona Terrace, and the expanding influence of the University of Wisconsin, and the decade assumes legendary status. 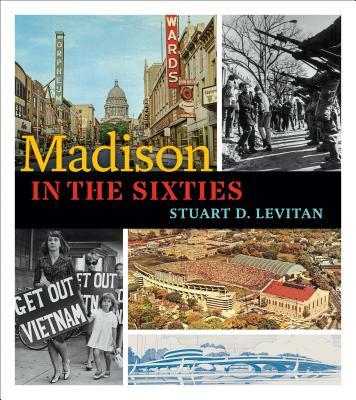 In this first-ever comprehensive narrative of these issues—plus accounts of everything from politics to public schools, construction to crime, and more—Madison historian Stuart D. Levitan chronicles the birth of modern Madison with style and well-researched substance. This heavily illustrated book also features annotated photographs that document the dramatic changes occurring downtown, on campus, and to the Greenbush neighborhood throughout the decade. Madison in the Sixties is an absorbing account of ten years that changed the city forever. Stuart D. Levitan is an award-winning print and broadcast journalist and has been a mainstay of Madison media and government since 1975. He is the author of Madison: The Illustrated Sesquicentennial History, Vol. 1, and his articles on the history of Madison have appeared in Madison Magazine, On Wisconsin, the Isthmus, and the Capital Times.